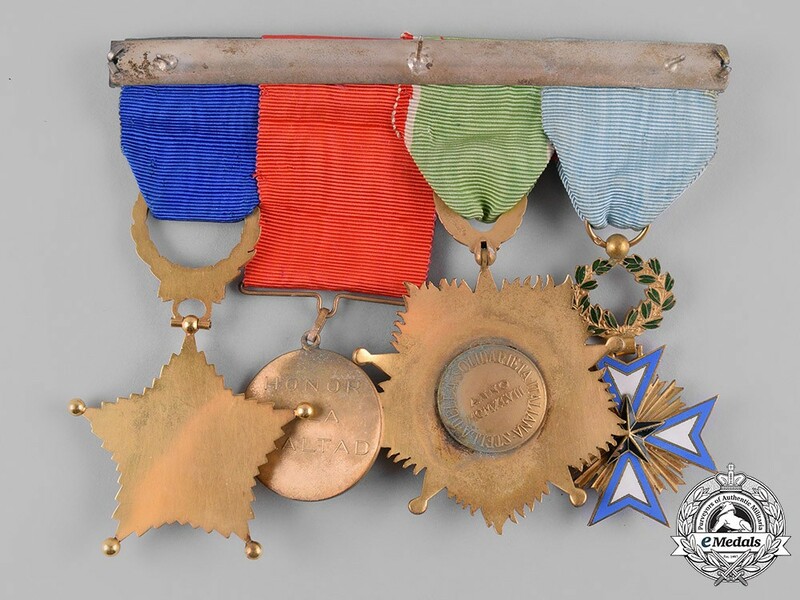 A medal bar with four decorations, including a Dahomey, French Protectorate. An Order of the Black Star, V Class Knight. (Ordre de l'Étoile Noire). Instituted in 1889. In silver with blue, white, black and green enamels, measuring 37.84 mm (w) x 60.40 mm (h - inclusive of its wreath and laterally-pierced ball suspension), presenting loss of enamel on reverse centre, on loop for suspension from period original ribbon with rosette, and in otherwise near extremely fine condition. Italy, Republic. 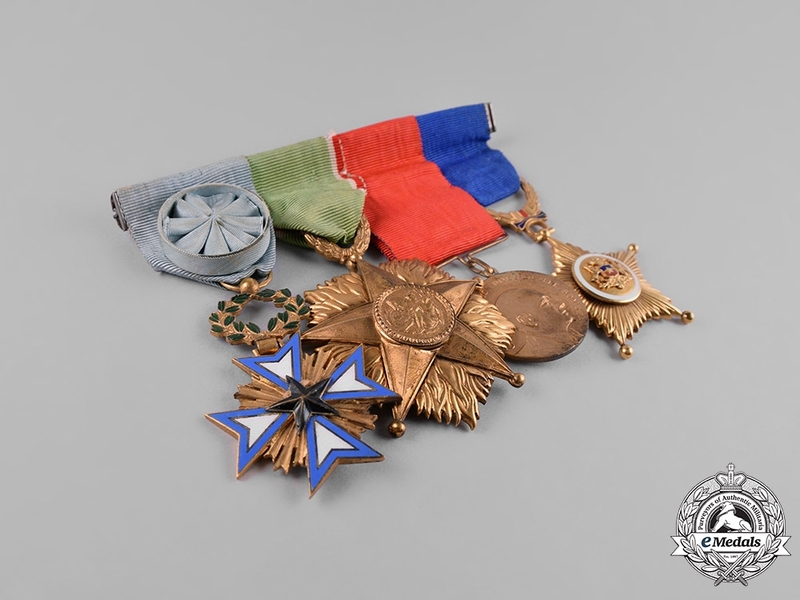 An Order of the Star of Italian Solidarity, Knight. (L' Ordine della Stella della Solidarietà Italiana). Instituted in 1947. A gilded bronze, five-pointed, faceted star with ball-tipped finials, with flames between the arms, the obverse centre presenting the Good Samaritan within a beaded border, the reverse presents the inscription ANNO MCMXLVIII, circled by the inscription STELLA DELLA SOLIDARIETA ITALIANA, maker marked on wreath suspension for GARDINO ROMA, measuring 56.98 x 80.80 (h - inclusive of wreath), suspended from period original ribbon, and in near very fine condition. A Nicaraguan President Somoza Medal, the obverse presents the bust of the president bordered by the inscription CONDECORACION PRESIDENTE SOMOZA, the reverse inscribed HONOR A LA LEALTAD (HONOR OF LOYALTY), measuring 31.15 mm in diameter, suspended from period original ribbon, and in near very fine condition. Chile, Republic. A Star to Military Merit. 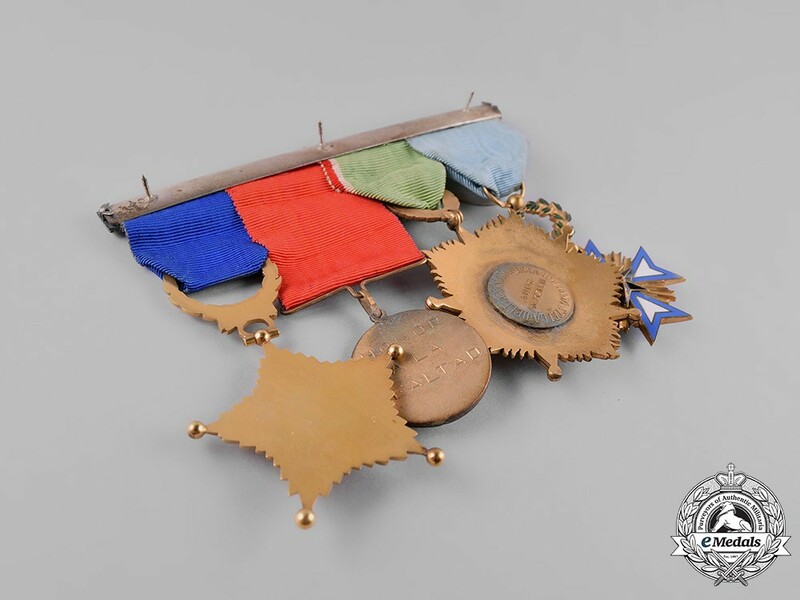 (Estrella al Mérito Militar). 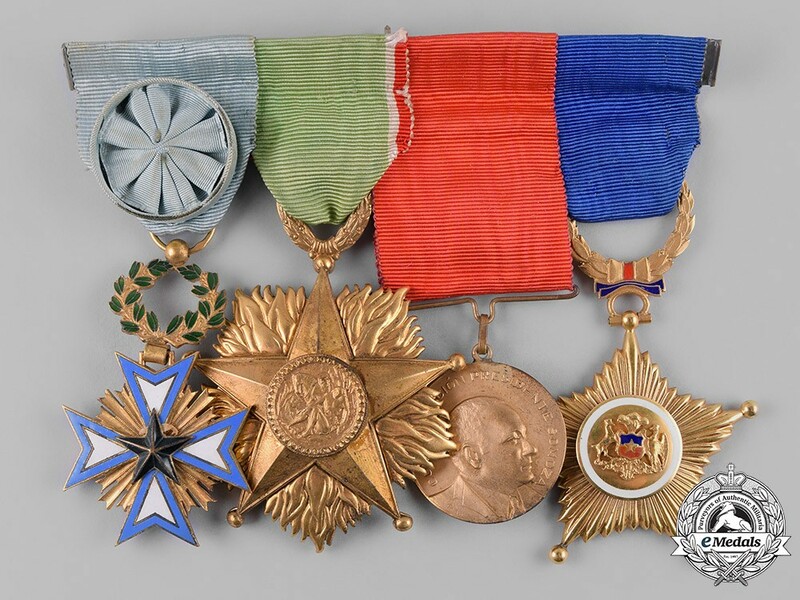 A multi-rayed star in gilded bronze, bearing the Chilean coat of arms, measuring 48.55 mm (w) x 81.44 mm (h - inclusive of wreath suspension),suspended from period original ribbon, and in extremely fine condition. All mounted to a ribbon bar measuring 127 mm long.